For the past few weeks I've been showing you all these bento boxes and my favorite kitchen tools...but wait a sec, this blog is meant to be about cooking! And I haven't shown any actual bento lunches yet! Truth be told, I'm still working on my "bento-queen" side. My mother never made Japanese bento for me. (I'm serious, never. I think one reason she married an Australian was to escape bento-making!) So I always assumed that bento-making was a tedious waste of time, best to be avoided. 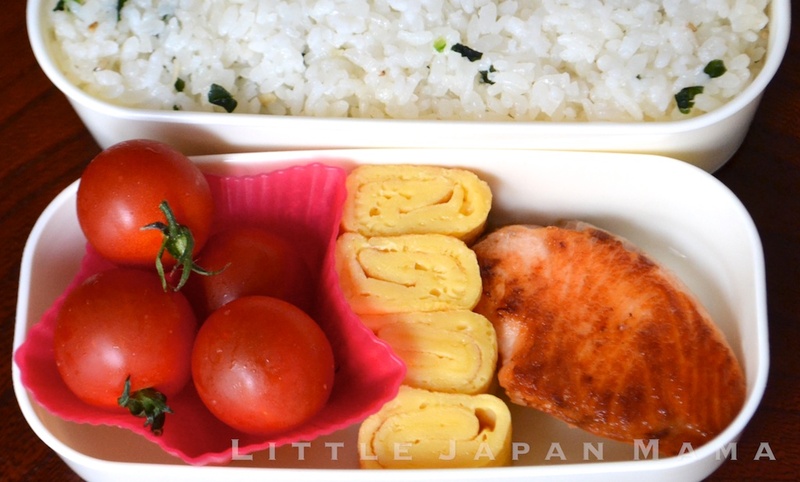 To my surprise, there's nothing tedious about basic Japanese bento! In fact, it usually takes me less than five minutes!! I couldn't make sandwiches faster than that. The key is to have everything ready-made, and just put them together in the box. Typically, I pack the rice into the box the night before while it's still hot, and leave the box out on the bench overnight (so it's still soft the next day), and if using leftovers I put those separately in the fridge. Then in the morning, I get the leftovers (okazu) from the fridge and pop them in the box. eg: Nikujaga, Sweet and sour pork, Yakitori sticks. anything else in "Okazu Mains" section, in an even smaller portion. 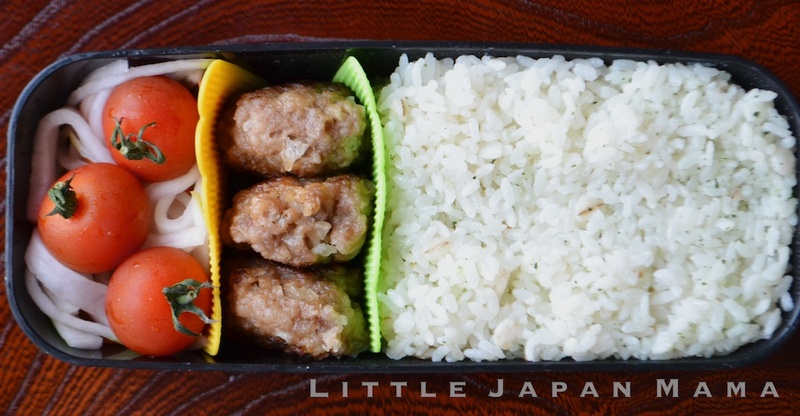 = A delicious and super-easy Japanese bento, in less than five minutes! Make sure you use short to medium grain or Sushi rice, that is still soft at room temperature. At least 2-4 types of okazu. Since we're doing small portions, we need a few different items to fill out the bento box (and your stomach) and make it interesting. You can do more, but I'm lazy and 2-3 is my standard. Generally at least one type of protein okazu (main) and at least one type of vegetable okazu (side). Okazu must be bento-able. It must taste good even when it has cooled down, it must be safe for a few hours at room temperature(eg fish must be salted), and it can't be soupy (we don't want leaks!). 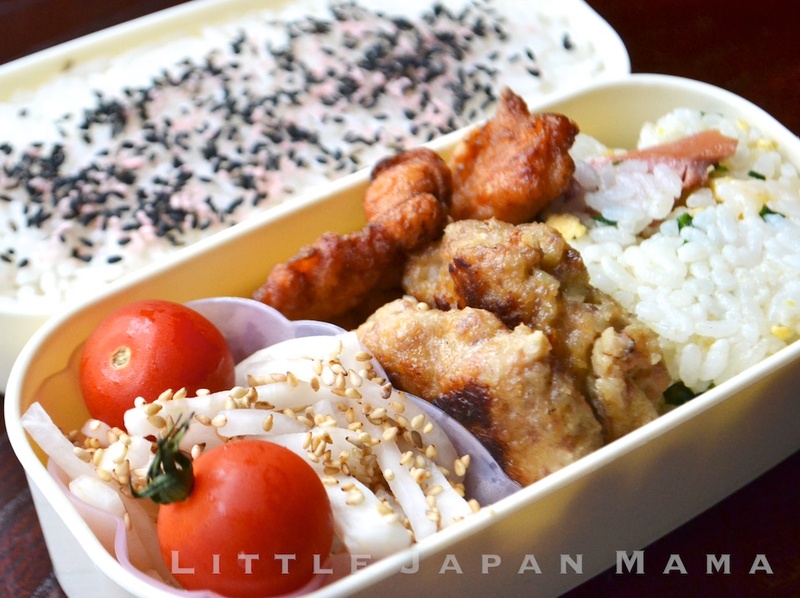 Top: Chicken Karaage (just microwave re-heated from frozen), daikon namasu, lettuce and cherry tomatoes. Ume-gomashio with Kamaboko flowers Furikake on the rice. Salted Salmon (pan-fried), Spinach ohitashi, Watercress, daikon and cherry tomato salad (all dinner leftovers, packed last night and kept in the fridge). Rice with gomashio furikake. Silicone Flower Cups. Mini Hamburg, Chicken Karaage, Fried Rice (leftover), daikon namasu and cherry tomatoes in a Silicone Flower Cup, ume-gomashio furikake on the rice. I'm looking at bento recipies that are easy and that I can make in a rush to go to school just in case I wake up late. Thanks for the recipies I'm only in junior high, but I'm really into Japan and wanted to make a traditional Japanese style lunch so thanks for the tips. can you still order these dishes? if not. anyone know where I can get them? These bento boxes look tasty but I don't need to make something that I'm going to have to cradle like a baby the whole time on my way to and @ work , Hit one bump on road or hit the brakes for any reason and my ingredients are going to be all over my bento box, Thus making all the asthetic work you did pointless. HAHAHA that's a reasonable concern. Actually, my husband wraps his bento box in a small plastic bag and throws it in his backpack. He runs to the train station half the time because he's running late. lol And when he opens his bento box at lunchtime, believe it or not, everything is just where I put it. HOW? This is how home-made bento boxes work! Look closely at the photographs. You must pack every ingredient tightly so it has no room to move. So when you throw your bag, everything stays in place inside the box. 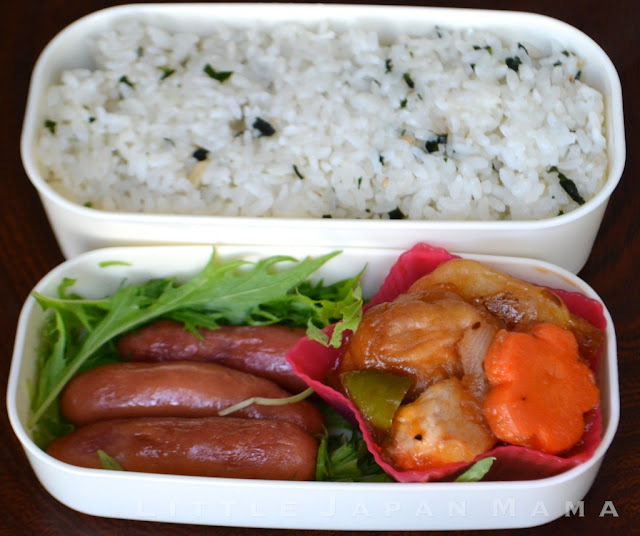 Another benefit of the tight packing of a bento lunch is that it means that bento boxes are very small, my husband takes a 500ml box plus one onigiri, or a 800ml bento box, but it's enough for his big appetite, as long as it's packed tightly. You certainly don't have to cradle it like a baby. As long as you make sure the lid stays on, you'll be fine! What are these cute little flowers on top of the rice? i really love Japanese stuff. and i'd love to make bento to bring with me to work.but i'm a student and have a small budget, and i live in America where getting certain ingredients is hard. so how can i make a good somewhat Japanese bento with what little money i have? I love Daiso! But it's $2.80 here in Australia! This is amazing thank you for this! I work at a nursery and we're having a bento day activity where we're inviting the parents along and help make the children's tea with my bento accessories I've collected over time! You have given me so many great ideas on what to do with them as well as what to make in advanced so again thank you! Thanks for your comment, Pinguu! All the best for your bento day! I need to admit you have half convinced me that making bento is easy :P And trust me, I want to be a new convert. I love idea of bento, how it looks and how it works. But it is different from what I'm used to. The biggest issue for me is rice. I came from the potato culture and I'm not biggest fun of rice. But when I tried a nicely done sushi rice, I realise it is just rice I ate till this time was crap. Now I live in UK, I have access to Japanese rice or sushi rice, but when I think about spending so much time to cook it... I do not have a rice cooker, and the nice once are horribly expensive... Do you have any nice and easy way to make rice? Valdez, thanks for your comment! I'm not sure what method you have been using to cook rice, but pretty much all Asian countries use the absorption method, which is very little effort. Place your rice in a saucepan (preferably one with a solid base), rinse the rice at least three times. Add water to double the depth of the rice. I use my finger to measure the depth. Like, rice to the first knuckle, water to the next knuckle. Bring it to a boil over high heat, put the lid on, and place it on very very low heat. Leave it for twenty minues or so. Medium grain calrose is very cheap in Australia and can be used instead of Japanese rice varieties. I'm not sure what is a available where you are, but all the best! Thanks for quick reply :-D When I was a child that was only available method to do it but then, in my country, rice was kind of unpopular, more like posh stuff. It was potatoes everywhere. Later they introduced rice in bags, just boil the water drop the bag in 15 minutes and its ready. But it is long grain rice. So it is easier then cooking short grain in this way. I think I would need to get and try it anyway. As for variety, you can get sushi rice in every market. Online you can get a lot of different kinds. They are not cheap though. You also mentioned that you are freezing rice. How well it takes it? I found your site awhile back and made the Hambaagu and my girls adore it when I pack that for their lunch for school. After school let out for the summer they were eating all the frozen ones I had left for breakfast with a fruit bar lol. We don't have actual bento boxes, but make due with the lunch containers that their grandparents bought them. They have been looking forward to the first week of school and what they are going to have packed all summer. Do you know of anywhere to purchase the Japanese Wieners from? Australian ones just don't taste the same cold! Do you leave the food cool down first before closing the lid if it was heated before putting the box? Thanks. Make sure bento boxes are thoroughly cleaned (including cleaning silicone seals) and air dried, or if wiped, with a fresh cloth. I'm concerned that you leave cooked rice out on the counter for many hours. There is a bacterium that likes to grow in cooked rice that causes very unpleasant sickness and diarrhoea, rice should always be cooled quickly and kept in a refrigerator to minimise the risk. Nice! There's a Daiso near my area so I can easily find some silicon flower cups but in the meantime will cupcake liners do in a pinch? Sure, cupcake liners will do, as long as the foods around them are not wet! Good luck! I'm a 13 yr old girl who loves all Japanese culture (mostly because of anime!) and i decided to make a bento next week for lunch. the only thing is i don't have a bento box and all my silicone cupcake cases are too small for my lunch box, so i was just wandering how big should the boxes be. A plastic container of 500ml to 700ml should be just right for you! Have a great lunch! Cherry tomatoes are for turtles. 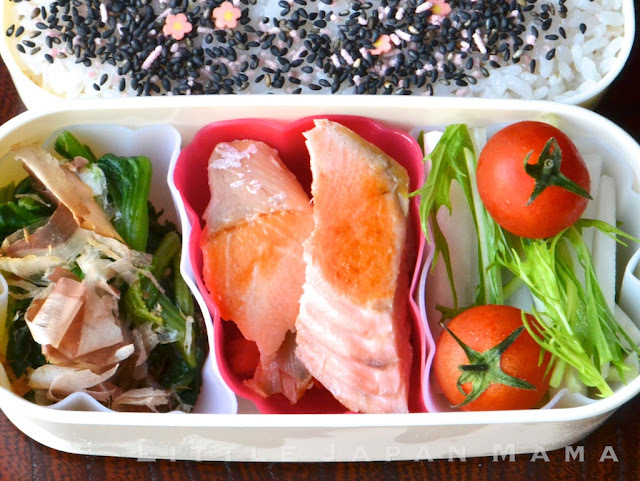 Great bento ideas! My only problem is I'm fourteen and can find basically none of these items in my area. Are there any ingredients I can find in Kroger's, Aldi's, or Walmart? I apologize for sounding so ignorant, but if I send a bento box with my husband to work, does he refrigerate it? He should, right so the meat doesn't spoil? Thanks for sharing this. 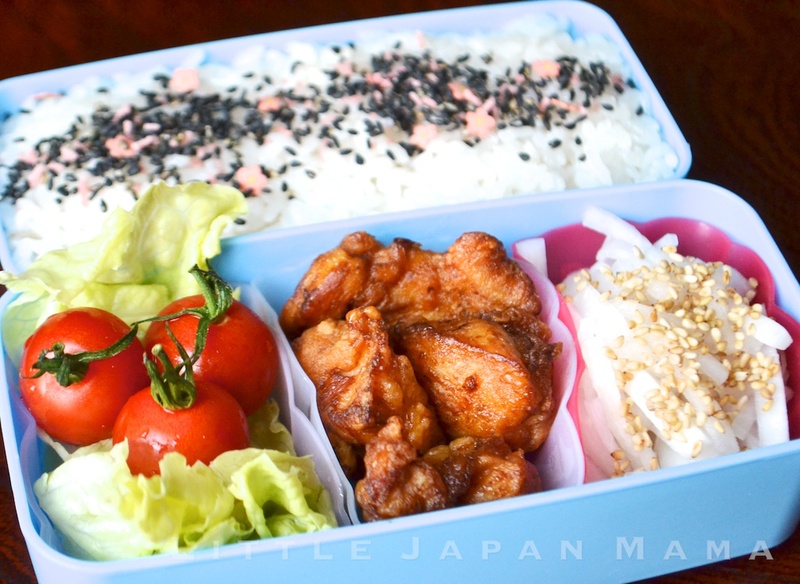 Your bentos are so cute. Hi Judy! If your husband has access to a refrigerator, that is great! 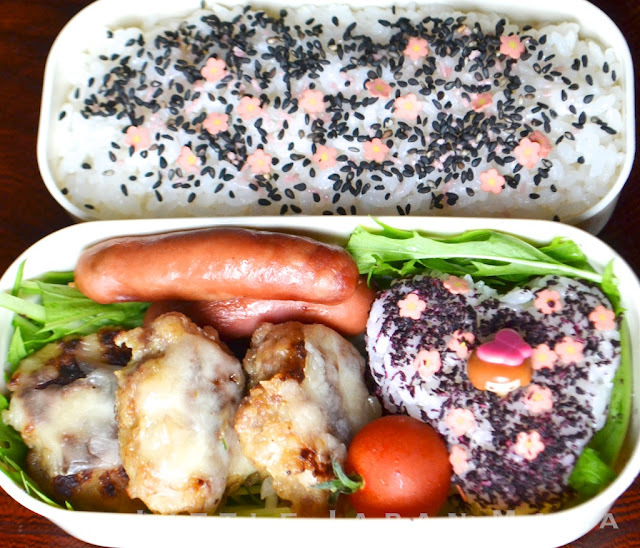 In Japan, it is quite normal for bento lunches to be stored unrefrigerated for three or four hours, just as westerners might take a ham, cheese or egg sandwich in their lunchbox unrefrigerated. In theory it is not risk-free, but my family members have never had upset tummies from their lunches. I just do what I can to avoid spoiling, for example, thorough cleaning of the bento box, try to use chopsticks or other utensils rather than hands when filling the box, make sure the bento lunch is eaten within a few hours (throw out any leftovers!) , using salt as an ingredient in meat, fish or egg items and don't include items which are risky to begin with, such as something that is a few days old etc. It was really a nice post for me. Hi I. Was wondering roughly what size are the protein portions? Ie the piece of salmon is it about half a palm size? I have a lot to eat.